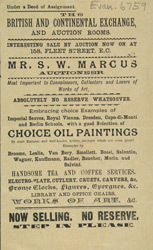 Auctions became very popular during the 19th century. The auction business had previously focussed on selling property or personal estates, but by the middle of the century London auction rooms in particular were starting to specialise in other items. This was partially because of the establishment of estate agents to deal solely with property, but also because of a surge in public interest in antiquities and the decorative arts. Competition became fierce between such London auction houses, each claiming to sell only the finest pieces of furniture and most magnificent paintings.